Class pre-registration and pre-payment is a must. You are not considered registered until the class fee is paid. Big Sky Quilts will cancel event. Join us to create a unique project to use yourself or share with others. Each session participants will have the opportunity to complete one or several items. February projects will be gifts for the kitchen. Get exclusive ruler kits and tutorials delivered straight to Big Sky Quilts each month! The Long arm Ruler of the Month Club is great opportunity to challenge your quilting skills and build ruler work confidence. Each month in the six-month series features a debut acrylic ruler paired with mentorship from your local shop, step-by-step video instruction and design ideas. The February ruler is the HQ Petal Pusher Template. Make this quick and easy small wallet using cork. Small size 5" by 3 1/2" to fit easily into any size purse or your pocket. Wallet is the perfect size for credit card, drivers’ license and a few bills. Using cork and matching or contrasting thread create this attractive wallet. It can be lined with anti-scam fabri c for additional security. Sewing with a triple stitch on your sewing machines is a quick way to make your stitches strong and secure. Class is for the beginner as well as the experienced quilter alike. Do you or a loved one have a collection of T Shirts that you have said “Someday I am going to make a quilt out of these? This is class is for you to make a fun and easy T Shirt quilt. Construct this colorful quilt the size you want. The more T Shirts you have, the bigger the quilt will be. 15 to 20 shirts will make a lap size quilt. Using shop templates and iron on fusible interfacing the entire shirt will be cut so all pieces fit together. During the first session you will be preparing your clean T Shirts for cutting using shop templates to cut your shirts. Using fusible interfacing applied to the pieces the quilt will be assembled in the 2nd and 3rd sessions to finish your quilt top. Great shoulder bag with zipper top, 6 pockets inside and a front cell phone pocket with zipper is easy to construct. Measuring 15 1/2 inches wide, 11 1/2 inches tall and 4 inches deep it will hold all your valuables. Instructions are easy to understand and fun to sew! Photos are included for each step. Pick 4 of your favorite fabrics and join us for 2 classes to construct this beautiful lined bag. You will be using fusible fleece and interfacing to have a stand up bag with two matching straps. Let’s sew together and create a Poppin’ Diamond table runner without Y seams all with the help of the Sidekick Ruler. This project is guaranteed to make you go WOW. A 16 inch octagon shaped table mat constructed with colorful combinations light, medium and dark fabrics will be a bright addition to your home. 2 or 3 blocks can be joined together to make a longer table runner. Learn how to use the SideKick Ruler to cut diamonds and techniques for working with bias cuts. This class is an opportunity to combine machine piecing and applique into an attractive wall hanging or table runner. Skills will include making no waste flying geese in several sizes and using fusible backing appliques. This is a quick and easy project. The kit for the table runner contains pattern, fabric and fusible, pre-cut geese to applique on the top after it is pieced together. The background is pieced, including flying geese blocks of several sizes. Register at least 2 weeks in advance to insure kit and ruler is available. Come join us to make this cute, cuddly lap quilt made with Minky. The friendly fox will keep you warm on a cool evening or make a great gift for a little one. 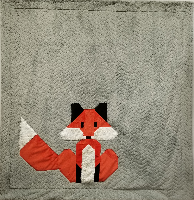 Class will be making a 36 inch x 44 inch pieced fox lap quilt. Kit contains all fabric to make the pieced fox and fusible stabilizer. You choose the background fabric and backing. Add borders if you want it bigger with additional fabric. Tips and techniques will be shared to make working with this fun fabric easy for the first time user or more experienced sewer. Learn how to stabilize Minky to prevent stretching and make sewing seams easier and why it is important to use a ball point needle for stitching. The quilt is finished without binding. Register at least 2 weeks in advance to insure kit is available. Classic and professional this bag combines high-end detail with practical functionality. The extra-long zipper opens wide for easy access while the side clips provide its stylish figure. This bag features an optional removable shoulder strap and interior zippered pocket. Class will be making the handbag, 11 inches long, 7 inches tall and 8 inches deep. Customize your bag with your fabric selection and use cork or vinyl for contrast. This fully lined bag uses several types of fusible interfacing and stabilizer to give it strength and durability. Must have basic sewing skills, including putting in zippers. Register at least 2 weeks in advance to insure pattern is available. Bag hardware must be ordered if not in stock a minimum of 2 weeks in advance of class. Gather 4-6 friends and an idea of what kind of class you want, and call (406-727-1757) Marlene on a Wednesday to work out details. We will get a model made and set up your class on your timeframe.